Please be sure to submit your public comments to IACC by Tuesday, January 5th at 5:00 pm Eastern time. AIM has submitted a public comment. Please view it here. Jill Rubolino on BlogTalkRadio. FORCED VACCINATIONS - Experts tell us what to do to avoid CPS PROBLEMS. Please join Autism Is Medical in welcoming Nikki Tomczak to our team! Mother to three children ages 19,14, and 12, for the past two years Nikki has been a valuable resource not only as a parent in our community but as co-organizer of the Autism Is Medical Houston support group. Previously a patient coordinator, Nikki now spends the majority of her time researching and coordinating appropriate medical care for her youngest daughter Olivia. Olivia’s complex diagnosis consists of Mitochondrial Disease, bowel disease, autonomic dysfunction, sleep apnea, and developmental encephalopathy which are a result of a severe adverse reaction to her vaccine schedule. We are thrilled to to add Nikki to our team as the Social Media Director and thank her for her tireless efforts to help us move AIM’s mission forward. AIM is proudly hosting a panel at the upcoming Summit hosted by The Autism Trust USA "Give Autism a Chance Summit 2." 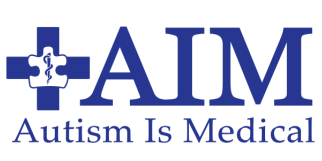 AIM will host Autism and Medical Emergencies: AIM to be prepared. Please join us on April 18, 2015 in Austin! We are looking forward to seeing everyone there! For more information about this event please visit the "Our Events" tab above. In the News! The Autism File Magazine has included an article featuring AIM in the August edition. View Article Here. AIM will be attending the Autism One Conference in Chicago from May 21-24. We will be available at our booth to answer questions and take AIM care bracelet/keychain orders. Please stop by to see us. We look forward to seeing everyone there! Austin, TX., February 17, 2014 -- In a move which solidifies dedication to their mission, the organization Autism Is Medical today announced receipt of its 501(c)(3) designation. Founded by a collaboration of women who have personal experience with autism impacted children and families, the organization is uniquely qualified and well positioned to serve the growing needs of the autism community. Working in tandem with parents, community organizations, and forging relationships with professionals across numerous specialties, Autism Is Medical seeks to create and define awareness of an appropriate medical standard of care for all individuals impacted by autism. This standard includes but is not limited to: Accurate medical diagnostic evaluations, effective treatments, and comprehensive coordination of care aimed at significantly improving the lives of all those affected by autism. As of the most current statistics, 1 in 68 children and specifically 1 in 54 boys are diagnosed with autism. The patient population is increasing rapidly, making the mission and associated work of Autism Is Medical imperative to the community.